I Am the Sign and the Revelation and the Proof of Real God in the world. I Am the Testament and the Means of Freedom Itself. I Am Eleutherios, the Divine Liberator, Who Is Freedom Itself. We are certain that extraordinary statements like Avatar Adi Da's (at the top of this page) have been made by no more than a handful of truly great men and women in recorded history, at best. Clearly, even similar confessions are all but unheard of in the world today. So, as devotees of this Great Sage, we ask you to consider His Confession a Sign that in its purest form, religion is intended to free us totally from our doubts and fears, offering verifiable and self-validating Spiritual certainty. We have become His devotees because we've discovered that it can—and as regards Adidam, we know that it does. If you've ever wondered why most of the people you meet tend to believe that God only "spoke" directly to a modest number of Spiritual leaders, revolutionaries, prophets and teachers thousands of years ago, if they believe that to be the case at all, or whether there is a way to bring an end to the dark, increasingly destructive course of current world history, or how to make sense of a serious personal tragedy or national disaster, please recognize that such Signs are of tremendous importance. If you've ever seriously considered something like the simple fact that the space between us doesn't simply serve to separate us—it also joins us as part of a larger greater reality, our sincere guess is that you already appreciate the value of such Signs. When you take a good long look at Adidam, the first thing you discover is that Adi Da Samraj is probably the most prodigious Spiritual writer in history. And we can tell you that we have found answers to all our most pressing questions about life in His Written Teachings and (over the course of time) during the course of our living relationship with Him. Verifiable answers that are hardly available anywhere else, if they are available at all. So, each of us knows first-hand that He Is Who He Says He Is. Avatar Adi Da's Teachings are a Great Gift that He Has Tirelessly and Painstakingly Prepared over the course of more than thirty-five years. He refers to them as Wisdom-Teachings. 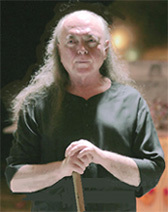 Adidam itself was founded by Avatar Adi Da some thirty-five years ago as the unique vehicle to make these profound Perfect Teachings available to people everywhere, and the relationship He Offers available to everyone as well. Read more about Adidam and the Adidam community in New York.